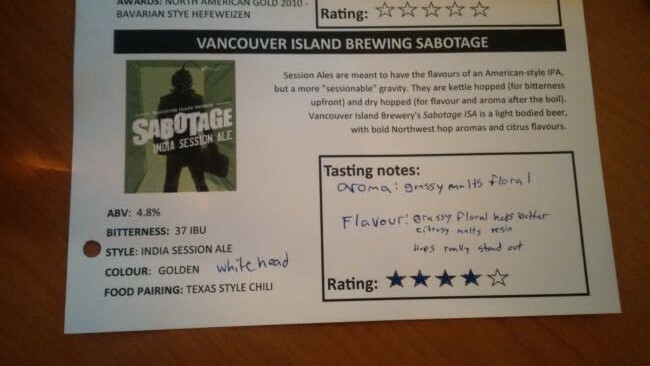 From Victoria BC’s Vancouver Island Brewery comes their new limited release “Sabotage India Session Ale”. This light version of an IPA pours a golden colour with a white head. The aroma consists of malts and grassy, floral hops. The flavour is of grassy, floral hops bitterness and a citrusy, resinous and malty finish. The alcohol content comes in at 4.8% with an IBU of 37. For a beer with a smaller IBU this really has a stand out bitterness. I really enjoyed every sip of this beer! Commercial Description: Your mission – should you choose to accept it, is to escape from the mundane and indulge your taste buds in a hop explosion! This is a plot twisting beer that embraces adventure. Light bodied with bold Northwest hop aromas and citrusy flavours, this beer won’t leave you with a bitter ending. Like every great blockbuster this beer screams for a sequel. 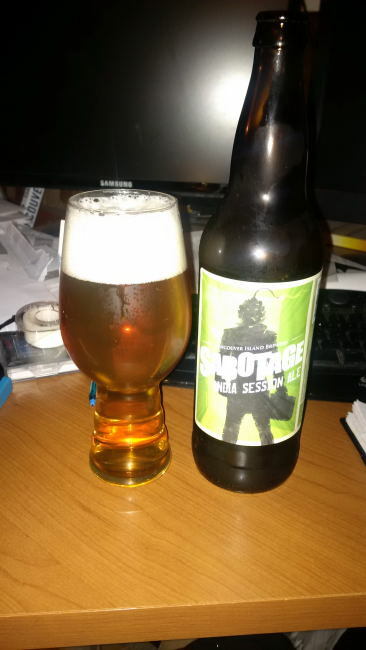 This entry was posted in India Session Ale and tagged bc, bitter, bitterness, canada, citrus, citrusy, floral, floral hops, grassy, india session ale, isa, malt, malts, malty, resinous, vancouver island, vancouver island brewery, victoria.